Home » Stuff About Me » Friday Night Lights! I just started creating collages of photos that I have taken with my phone. A little late to the game? Probably. Does my phone take collage-worthy photos? Probably not. Is my phone battery conducive to relying on it for memorializing my day? Ack. No way. But there you have it. I made a TERRIBLE collage of our MN State Fair trip, but it isn’t share-worthy. Maybe I’ll try again. My first phone photo collage! 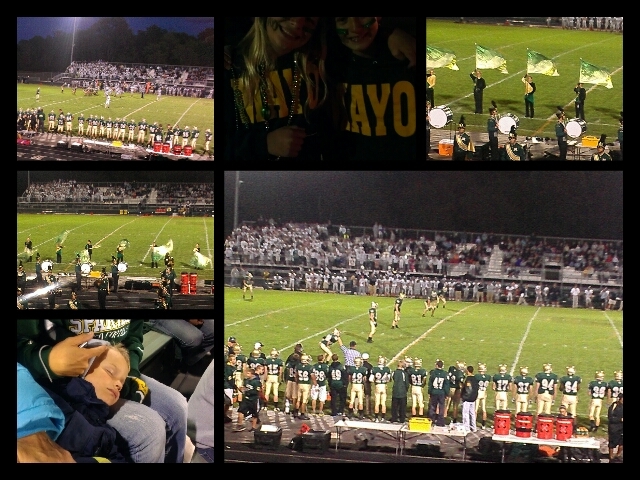 The collage above is a fun glimpse into my first football game of the season. I love football season. Crisp fall nights turning into crisper fall nights. Hot chocolate and popcorn. Good stuff. I look forward to another night under the lights watching my nephew and his friends. Football is always better when you have a personal relationship with someone on the field. Do you have a favorite photo collage app? This entry was posted in Stuff About Me and tagged Collage, football, friday nights, phone pics, photography, travel. Bookmark the permalink.